Interview with Aaron Leonard, author of new book detailing FBI repression of 1970s revolutionary movements | Fight Back! During the late 1960s and 1970s, many young people became revolutionaries. Inspired by the revolutionary process in China, they worked to apply Marxism-Leninism, Mao Zedong Thought to the conditions in U.S. The RU was one of most successful of those groups. Fight Back! 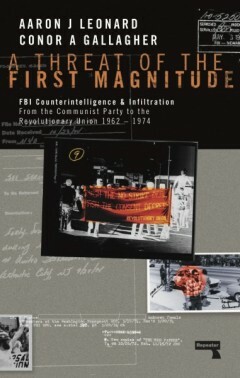 : You have coauthored two books, A Threat of the First Magnitude, FBI Counterintelligence & Infiltration from the Communist Party to the Revolutionary Union 1962-1974, and Heavy Radicals: The FBI's Secret War on America's Maoists, the Revolutionary Union / Revolutionary Communist Party 1968-1980, that deal largely with repression directed against the Revolutionary Union (RU). What was it about this organization that made it a high priority target for the government? Aaron Leonard: The Revolutionary Union, begun in 1968, quickly became the largest Maoist organization in the U.S. While its founders included a core of people who had come through the Communist Party and the Progressive Labor Party - Leibel Bergman being the most prominent - it was able to attract a significant number of radical youth, especially students. Unlike the Black Panther Party, to say nothing of the Weatherman, an offshoot of Students for a Democratic Society, which by 1970-1971 were rapidly contracting, the RU was expanding. It was able to gather together radical collectives throughout the US - including elements of SDS - into a single cohesive national organization. The group also, for a time, held what has been called the “China franchise” - the support of the Chinese Communist Party - because of its adherence to Maoism. This in turn put them firmly on the FBI’s radar. China, the largest communist country in the world, was a major geopolitical adversary of U.S. As a result, the Bureau saw the RU/RCP as a threat to U.S. internal security of the “first magnitude” - their actual words - and acted accordingly. Fight Back! : In researching your books, you make extensive use of FBI documents obtained under the Freedom of Information Act (FOIA). Based on this, how extensive was the surveillance of the RU? Leonard: There was an enormous amount of attention paid to the RU. As it was moving beyond its base in the Bay Area the FBI sent memos to its field offices throughout the country to audit whether the RU was active or was trying to get a foothold so they could implement counterintelligence measures. As we document in the books, they were able to place an informant on the leading body of the RU’s Bay Area organization by the group’s third meeting. They followed this up by inserting informants into the mid-level leadership of the San Jose branch of the RU and eventually got another informant onto the group’s central committee and then its secretariat, the group’s day-to-day leading core. We spend a good deal of time in the second book making the case that that person was Don Wright, an African American, ex-military informant who used the cover of having been in the FBI’s fictitious Maoist sect, the Ad Hoc Committee for a Marxist Leninist Party, as his bona fides of being a revolutionary communist. Fight Back! : Are you still uncovering more information about the government’s war on the RU? Leonard: We are awaiting certain key files, especially the records on Leibel Bergman - who likely had the largest FBI file of anyone in the New Communist Movement. We are also awaiting Darrell Grover’s file, who we argue was the earliest informant in the RU. There are also 15,000 plus pages of the FBI’s Ad Hoc Committee stored in the National Archives that will be released in small increments over the coming years. It is my sense that within these are a good many secrets, which may upend our understanding not just of the RU, but quite a few other groups that were active in that period. Fight Back! : Are you planning to write more on this? Leonard: At this point I am done writing about the RU exclusively - and you can already see a shift in focus with the second book. Saying that, if we discover important information we will find the ways to share what we learn. Fight Back! : How has the reception been to your latest book? Leonard: For those who are aware of it and have read it the reception has been quite positive. We have had some very thoughtful reviews, including from your publication, and people seem generally appreciative of what we have to offer, including accepting the hard truths of informants operating in high places. However, it is my sense that both books have not been seen by enough of the people who could really benefit from them. And here I have in mind those who are in one way or another fighting for a better world. While I’m no longer a partisan of any group or even much of a political activist, I do not want folks who are to be victimized by the same antagonistic forces and mistakes that have been made in the past. In that respect I hope more people will become aware of our work.